The Spiral Cutter SPIRALFIX is the indispensable kitchen tool for every vegetable fan. Based on the time-tested principle of the pencil sharpener, it transforms countless sorts of vegetables into delicious vegetable spaghetti, without effort and in no time at all. Using it is simple, convenient and extremely safe: Just open the folding lid, use the adjusting wheel to set the desired width of cut and place the vegetables in the box. 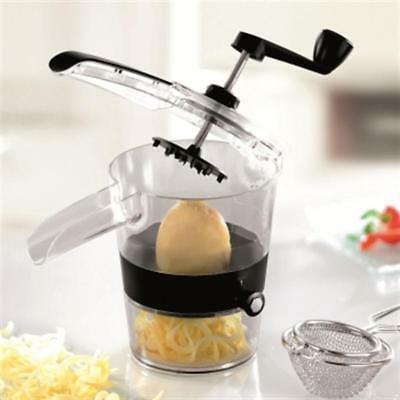 Now close the lid, turn the crank handle (pressing down gently), and the desired vegetable spirals fall into the non-slip holding container. The long spirals can be produced with ease because two high-strength special knives made of blade steel work together perfectly in the box. The best part of it is that the two knives are able to cut the vegetables into spirals almost without any scraps.